Working in the test kitchen at Weber provides me with the opportunity to use all of our latest and greatest products. Our team of product managers and engineers are always coming up with exciting new products to enhance the grilling experience. That being said, I’m kind of a minimalist when it comes to accessories. I have to really, really like something if I’m going to part with my money to buy it. The new Weber ceramic-coated veggie pan is one of those products. It doesn’t take up a lot of storage space, it’s easy to clean and most importantly to me, it serves multiple purposes. 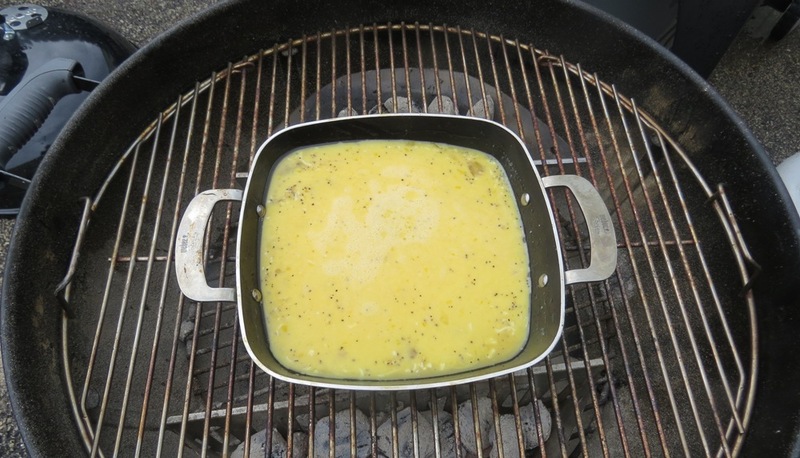 Obviously the pan is great for grilling vegetables and other small items that have a tendency to fall through the grill grates but it also comes with a non-perforated lid that I like to use to make egg frittatas. Cut up whatever vegetables you have on-hand (onions, asparagus and red bell peppers are my favorites), toss them with a little olive oil, salt and pepper. Using the grill pan, grill the veggies over direct medium-high heat until cooked through. Then in a large mixing bowl stir together eggs, cheese and the cooked veggies. ​Pour the egg mixture into the lid of the grill pan and grill over indirect, medium-high heat about 25 minutes or until the eggs are cooked. You can use any vegetables and cheese you like. You can also add potatoes, sausage, bacon or whatever you like – just make sure it’s cooked first before adding to the egg mixture.